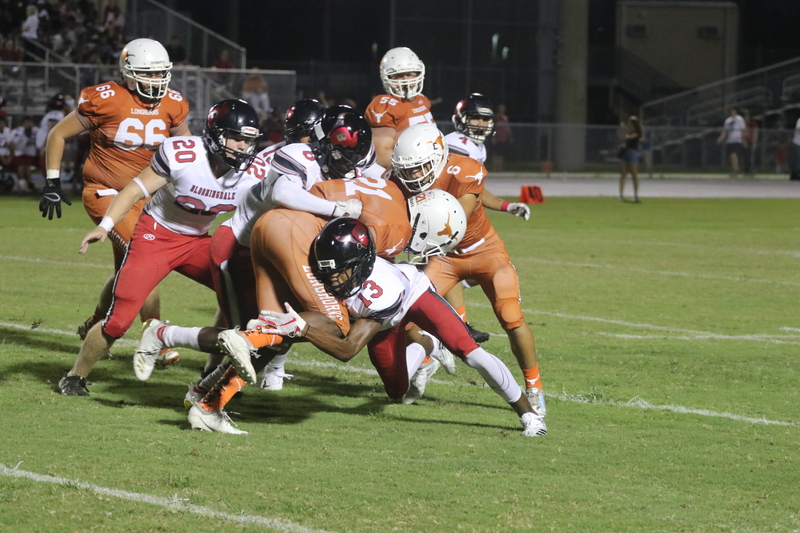 Bloomingdale gang tackles Lennard runningback Tito Hunt, #21 in orange, as Bulls smash Longhorns. The Riverview Sharks were the only South Shore football team to win last Friday. The Sharks hung on at home before a large crowd to beat a pesky Newsome Wolves squad 35-26. Three other area teams lost. Spoto fell to King in Tampa 28-18. East Bay lost its second in a row, this time at home to Plant City 24-7. Meanwhile, Lennard could not find the end zone as Bloomingdale overpowered the Longhorns 54-0 in Ruskin. 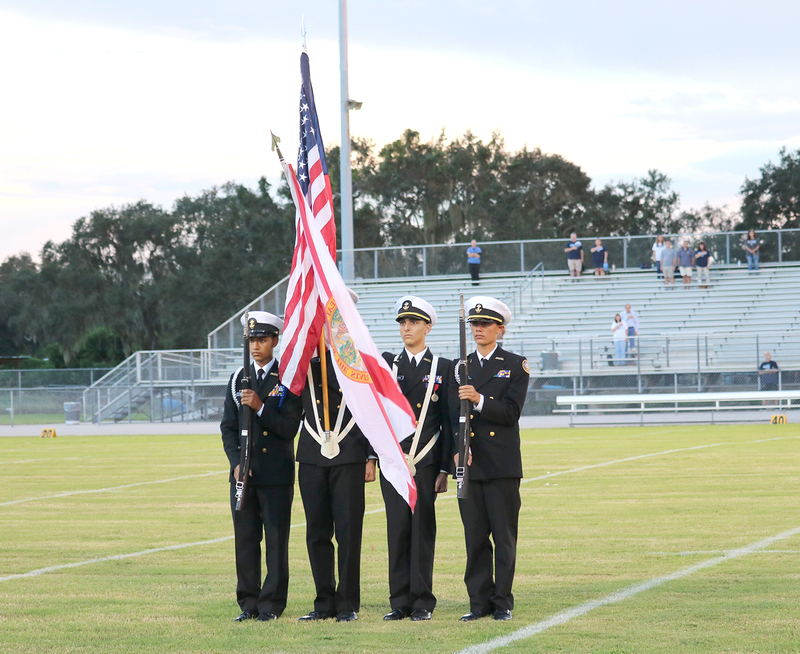 Riverview High ROTC presents the colors for the national anthem prior to kickoff in Newsome game. All four South Shore teams are at home this Friday: Spoto with Jesuit; Riverview hosts Steinbrenner; East Bay welcomes Bloomingdale; and Lennard has Tampa Bay Tech in Ruskin. Under the lights last Friday, Riverview notched their second win of the season, chewing up the Wolves from Lithia. Coach William Mosel’s Sharks used a balanced offense to survive Newsome’s ground attack. Although Newsome piled up 391 yards rushing, the visitors only gained 38 yards passing. 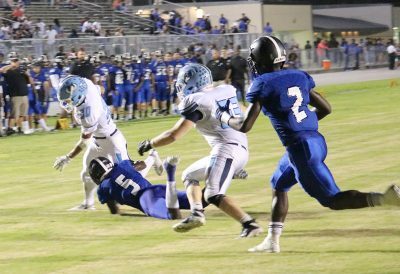 The Sharks rushed for 172 yards and picked up 166 in the air against Newsome. Riverview is 2-3 overall after an opening-season win over Freedom. The Sharks are looking to even their worksheet and go 2-1 in District play this Friday. In 8A-District 6 play, Riverview is now 1-1 with Steinbrenner coming to town from Lutz. Steinbrenner is 1-4 on the season and 0-2 in District. They lost last Friday to Manatee 31-0. The Spoto Spartans look to get back on the winning track after a second-half aerial rally fell short against King last week. Despite sophomore Spartan QB Jordan Guerad passing for 237 yards on a 10 for 23 night with a trio of TD tosses, Spoto could not overcome a 21-0 first quarter deficit in the King loss. Spartan receiver Jerson Singleton scored two TDs and Marwan Gilmore added one on a 79-yard Guerad pass play, all in the second half. Eric Johnson, Darius Gaffney and Jalen Bard were in on the most stops defensively for Spoto against the Lions. Spoto encounters an unbeaten Jesuit team, which is tied with Robinson for the 5A-District 10 top spot at 1-0. Coach Melvin Jenkins’ Spartans are 2-3 overall and 0-1 in District. Lennard was whitewashed 54-0 by the Bloomingdale Bulls in a game which went to a running clock after the Valrico visitors jumped out to a 47-0 halftime lead. In its 4-0 season thus far, Bloomingdale has outscored its opponents 179-0. Coach Matt Kitchie’s Lennard team is 1-4 overall and 0-2 in District and now faces Tampa Bay Tech this Friday. It’s another tough draw for Lennard as the Techsters are also 4-0 and 1-0 in District, scoring 114 total points with only 55 points scored by opponents. For the season, Lennard has scored a respectable 110 points with 197 points scored against them in their five games. Riverview defensive back TJ Robinson, #5, tackles Newsome runner as Cameron Lyles,#2, comes up to help. Coach Frank LaRosa’s East Bay Indians have the dubious task of “next up” against Bloomingdale this Friday. The Indians dropped their second in a row against powerful 5-0 Plant City, which scored 24 unanswered points at the Indians’ stadium last week. East Bay finally got on the scoreboard in the last quarter on a TD by quarterback Joaquin Isidro. In an unbalanced attack, the Indians gained a total of one yard with Jahkese Cruz hitting only 1 of 3 attempts. Rushing, the Indians’ Osorio carried 20 times for 79 yards. Other Indian runners carried 10 times for an additional 88 yards. The Indians lost 2 fumbles. 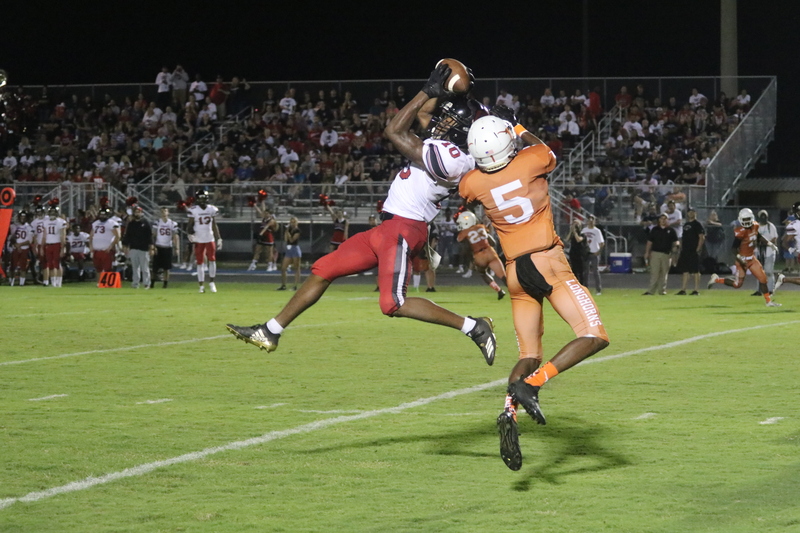 Trying to stem the Plant City offense for East Bay, with limited success, were Levi Marshall and Jontrell Oliver. East Bay sits at the bottom of the District standings with Lennard and Strawberry Crest, all at 0-2.